The Yankees after an off-day traveled to Chicago to take on the Cubs on a frigid afternoon, where wind chills dipped below forty degrees, and the wind was blowing forcefully in. This game had all the makings of a pitcher's duel with Michael Pineda facing off against the ERA leader of last season, Kyle Hendricks. In a low scoring game, ironically all the scoring came off the long ball. 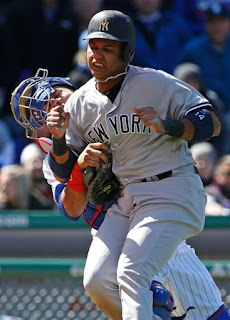 Hendricks is notorious for pitching to soft-contact, but the Yankees hit him very hard in the early going. The Yankees got robbed of two scoring opportunities in the first two innings by some quality Cubs defense. A first inning that featured Gary Sanchez getting hit by a pitch to welcome himself back off the disabled list and a nice tribute to Starlin Castro came to an end when Jayson Heyward made a diving catch to rob Castro of an RBI. In the second inning, Aaron Judge got gunned down by Ben Zobrist as Judge tried to score on an infield ground ball off the bat of Chase Headley. The Cubs initiated the scoring when Kris Bryant hit an opposite-field solo home run against the wind in the bottom of the first inning to make it 1-0 early. The Yankees failed to cash in on two baserunners in the third. 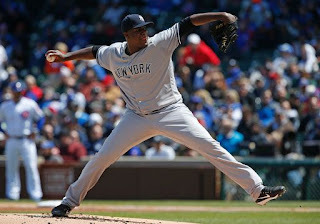 One of them was Michael Pineda, who had a base-hit through the hole between shortstop and third base. American League managers hold their breath when their pitchers run, and Pineda almost got thrown out at second on a bloop single by Aaron Hicks. The rally was ended after Sanchez grounded into a double play. The Yankees failed to capitalize with runners in scoring position again in the fifth, when Hicks was beat to first base by Anthony Rizzo by a single step. The Cubs threatened in the bottom of the inning, when Wilson Contreras hit a flyball to Aaron Judge in right field that he tracked poorly due to the roaring wind, allowing the Cubs’ catcher to reach third base. National League baseball then came into play as the pitcher grounded out to a shallow playing Castro and the ninth hitter Jon Jay grounded out to Didi Gregorius at shortstop. The Yankees knocked Hendricks out of the game in the sixth inning, when Castro and Judge hit back to back singles with one out. Cubs manager, Joe Maddon decided to try match up against Didi Gregorius by bringing in southpaw Brian Duensing. Gregorius then popped a ball up into shallow center, where it became victim to the wind and dropping out of Jay’s glove to load the bases. Headley then hit a line drive into right field where Jason Heyward's throw came slightly up the third base line, resulting in Castro knocking down Contreras. Contreras ultimately held onto the ball, and Castro was out. Michael Pineda was phenomenal all afternoon, but made another mistake to Kyle Schwarber resulting in a home run in the sixth making the score 2-0. The second home run of the game was also the second hit of the game for the Cubs. Pineda was pinch-hit for in the seventh, effectively ending his start at six innings and only allowing three hits. The game would remain quiet offensively, until the Yankees once again showed why this is one exciting team. Hector Rondon pitched the ninth due to Wade Davis pitching each of the last four days. A Chase Headley base-hit and Jacoby Ellsbury pinch-hit walk set up Brett Gardner’s at-bat with two outs. 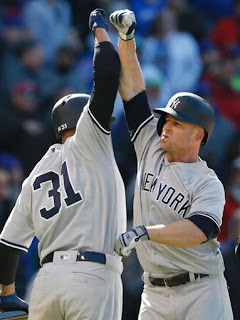 Down to the game’s last strike, Gardner hit a three-run blast to right field to stun Wrigley Field and give the Yankees a 3-2 lead. Aroldis Chapman was summoned to close out the game and pitch for the first time at Wrigley Field since the World Series. After a Chase Headley error, Chapman retired the side in order to secure the win. The Yankees had nine hits before scoring their first run and avoided being shutout for the first time this season. The Yankees will try to secure a series win, when they send rookie Jordan Montgomery, who will have his biggest test yet, to the mound on Saturday. The Cubs will send veteran Brett Anderson to mound, who is trying to rebound off a poor start. The game will air on FOX at 7:15 EST.